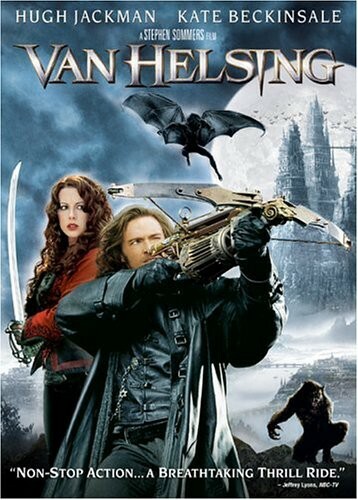 Set in the late 19th century, monster hunter Dr. Abraham Van Helsing is summoned to a mysterious land in East Europe to vanquish evil forces... evil forces with names like Count Dracula, the Wolf Man, and Frankenstein's Monster. Assisting him once he gets there is Anna, the heir of a long-running family committed to hunting down and destroying Dracula. Direction: Stephen Sommers Actors: David Wenham, Hugh Jackman, Kate Beckinsale, Special Features: 360-Degree Tour of Dracula's Castle; Outtakes; You Are in the Movie! ; the Legend of Van Helsing, Feature Commentary with Director Stephen Sommers and Editor/Producer Bob Duscay; Feature Commentary with Richard Roxburgh, Shuler Hensley and Will Kemp; Play the Van Helsing x-Box Game! 1.85:1, Anamorphic 16x9, Widescreen format. Language: English / Add. French, Spanish / Sub. English, French, Spanish. Year: 2004 Runtime: 132 minutes.